When planning my train heavy trip around the Highlands there were a few distilleries that quickly went to the top of the list. First amongst those was the distillery I currently, when pushed to make a choice, list as my favourite – Clynelish. It’s in the town of Brora which in turn is carefully positioned on the east coast trainline up to Wick, making it an obvious choice for the train user. The fact that it took me about 3.5 hours to get there from Aviemore and involved me getting the first train in the morning and the last train at night is by the by. As is my missing of my connection at Inverness due to the train running late and having to blag a spot on the sleeper train to avoid sleeping on a bench in the station. 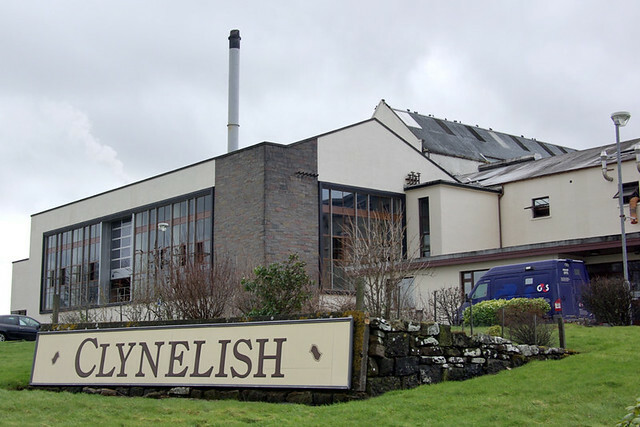 The history of Clynelish is not only the history of two distilleries, both of which were originally known as Clynelish, but also quite confused. The following is cobbled together from what Claire Fraser, the knowledgeable brand home manager (who was very honest about the fact that there are many stories), told me, along with my various online and paper resources. The first distillery was built on the site in 1819 by the Duke of Sutherland, better known for his role in the Highland Clearances. The distillery itself was in part a response to that, giving a place on the coast with employment for displaced Highlanders and also somewhere to sell local grain. The distillery was leased by various people before being bought and expanded by James Ainslie & Co, a blending company, in 1896. By 1912 Ainslie had gone bust and John Risk, already a major shareholder, bought the rest of the distillery and continued production. John Walker, yes that John(nie) Walker, bought into the company which led to it coming under the control of Scotch Malt Distillers in 1930, one of the companies that eventually went on to become Diageo, the current owners. In the 1960s SMD decided that they needed a more modern distillery on the site and built the current facility, known as Clynelish A (or occasionally Clynelish 1), in what has become known as the ‘Waterloo Street’ style, also seen at Caol Ila and Glen Ord, amongst others. Clynelish A came online in 1968 and the old distillery, now renamed Clynelish B, ran in tandem with it for 6 months before closing. Also in 1968 there was a severe drought on Islay, causing serious issues with supply of the traditionally smoky whisky that SMD needed for their increasingly popular blends. 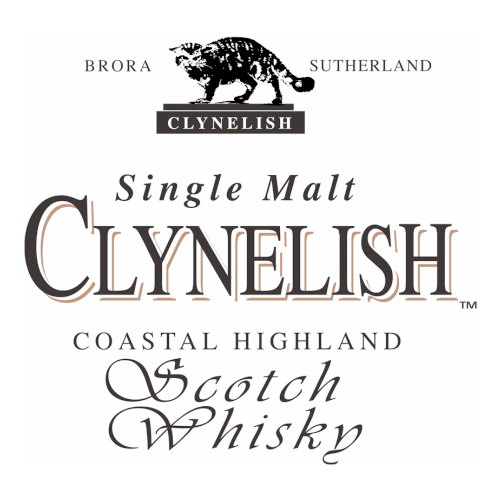 To help meet the shortfall they restarted Clynelish B in 1969 to produce smokey spirit, renaming it Brora. The reopened distillery continued running past the end of the drought, as SMD took the opportunity to rebuild Caol Ila to the same design as Clynelish, and it eventually closed down in 1983, one of the many casualties of the contraction of the industry at the time. …and to the right of the last picture, Brora. Clynelish has become a favourite amongst many whisky geeks, myself included, but Brora has acquired a legendary status over the years. The distillery is long closed and as the whisky has got older it’s become one of the cult brands in the single malt world. It was never intended to be released as a single malt, being merely a smoky component for blending, but some attention via the Rare Malts series and a love of the spirit within the industry has seen a few bottlings appear over the years, most of them highly rated. Clynelish itself didn’t really see the light of day as a single malt in recent times until 2002, when a Flora Fauna bottling was released. Since then it’s appeared as a 14 year old as part of the Classic Malts range, a special edition 12 year old for the Friends of the Classic malts, and as a Managers’ Selection bottling, as well as being a standard go to distillery for independents. Production at Clynelish is fairly standard, these days using unpeated malt from Glen Ord and an 80 hour ferment to produce a fairly fruity wash. The 6 stills are based on the Brora stills, although their sizes are reversed – the spirit stills are, in a departure from the norm, larger than the wash stills, taking two runs of the wash stills to fill. The distillation stage is the first point where you start to detect Clynelish’s distinctive waxy notes, an aroma that has a variety of stories around it. The way they tell it on the tour is that they have a greasy residue that builds up in the various receiving tanks and that on the few occasions they have cleaned it all away the waxiness has disappeared. These days they still do a bit of cleaning, but make sure they leave a bit of the goo behind to keep the signature flavour. After distillation all of their spirit is tankered away to the main Diageo facility at Stirling where it’s put in casks and then sent around to the various warehouses that the company owns in Scotland – they like to spread the stock around between their warehousing facilities so as not to keep all their eggs in one basket. 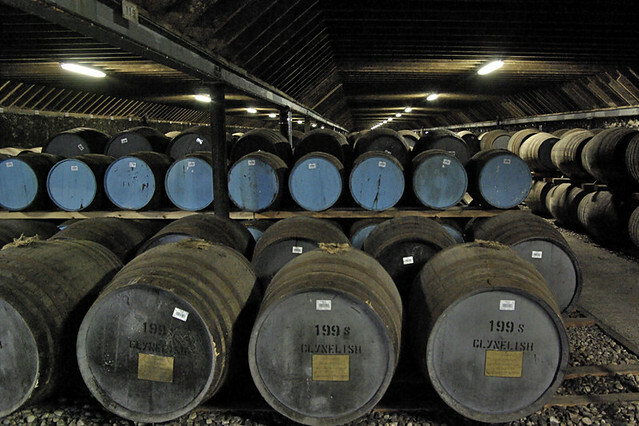 They have over 6000 casks maturing on site at the moment, with all of their warehouses as part of the old Brora site, just down the hill from the new distillery. 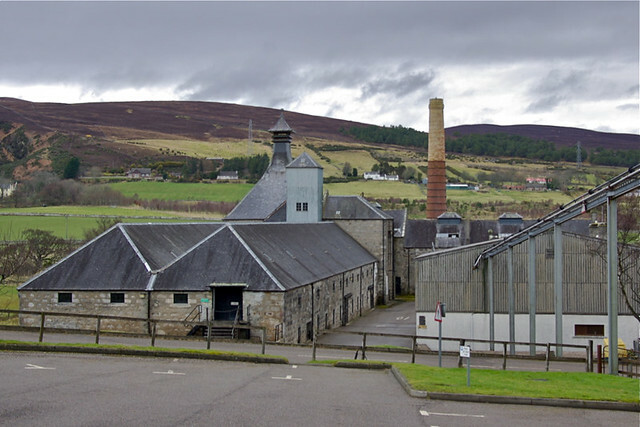 They used to fill casks just opposite the warehouses, with two filling stores still in place but unused – one for Brora and one for Clynelish – and there’s a now disconnected pipe joining the old site to the new for that reason (as seen on the right of the Brora piccy above). Their tasting room and library is down in one of the old Brora buildings, next to the closed still room where the stills are in still in place – the whole site is protected by Historic Scotland and they couldn’t do very much work on it even if they wanted to. Along with the Clynelish 14, Distiller’s Edition and Distillery Only bottlings (the latter of which we tried at the last Whisky Squad) Claire also brought out a pair of Broras, the 2009 and 2010 editions from Diageo’s yearly Special Releases. First was the Brora 2009, 30 years old and very much in the traditional Brora style. On the nose there was a burst of farmyard to start – wet hay, a bit of silage and some smoke. This was followed up with the expected waxy note as well as lots of fruit – cherry lips and pineapple kubes. To taste there was some smokiness backed up with more pineapple and cream, and an underlying earthiness with some leafy forest floor elements. It finished long, with gravel, sweet wood and coal dust. This is the sort of dram that shows me why people seek out Broras – all the bits I like from Clynelish with a farmy edge and a nice smokiness. Next was the Brora 2010, also 30 years old and not quite as big as the 2009. On the nose it was pure fruity sweets, pineapple kubes and Haribo gummi, along with cream, wax and a touch of brine. To taste it continued the sweet motif, with soft tropical fruit, orange boiled sweets and a lick of citrus smoke. Wood came out a bit more in the finish, with some anis and a hint of dusty cabinets. More towards the Clynelish end than the 2009 and not quite so interesting for it. Still eminently quaffable, although maybe not worth £300 a bottle to me. Whiskies drunk and distillery-only-bottling bought I tromped off back down the road to the station. While I missed picking up some Capaldi’s ice cream, a must according to everyone I know who’s been to Brora, I did manage to stop in at The Sutherland Inn for a swift dram before my train. Manager Leon is a bit of a whisky collector, as the bottle of 70 year old Glenlivet facing the bar and the stacks of bottles dotted around the place demonstrate, and it’s well worth a visit if you’re nearby. 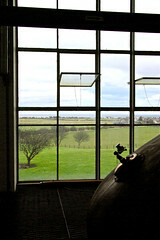 I did the Taste of Brora tour and you can find details of the the various tours they offer on their website. There are some more pictures up on Flickr.